Next-gen fishing boats: the sit-on-top. Next-gen fishing boats: the SUP (stand-up paddleboard). Yes yes, I know, this looks like a glorified surf-board. And it basically is. The SUP, or “Stand-up Paddleboard,” may not look like much, but it’s becoming a popular fishing platform. Now, there are versions with everything from seats to livewells to rodholders. While SUP boards started out as a way to get in a good work-out on the water, they’ve evolved. And it turns out that they have many of the same advantages as kayaks, when it comes to fishing. You can sneak up on your prey, without making a sound. You can glide into shallow backwaters and creeks where motorized boats couldn’t possibly go. The initial cost is far less than that of a modern powerboat. And you can launch one virtually anywhere. But SUP’s also have one advantage over kayaks: you can stand up (without rolling the “boat”). That means you can spot fish finning from farther away, and you can stretch your legs when you need to. 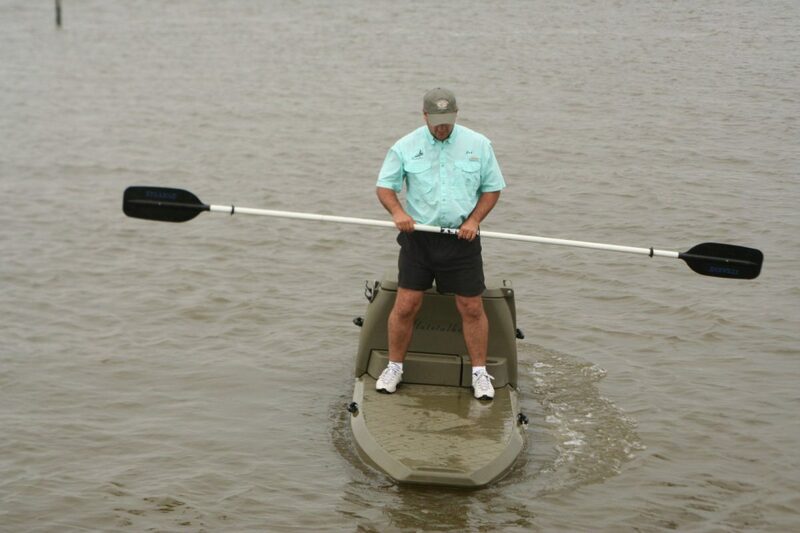 SUP’s are surprisingly stable, and easy to fish from. In fact, there’s even a certain group of anglers who take them off the Californian coast to fish for calico bass and other near-shore species. Not that we want to take any cues from those crazy Californians – at least one SUP angler out there has already been eyeballed by a great white shark large enough to snack on a SUP angler, and he even shot this YouTube video as the beast was circling around him. Crazy? Ummm… yes. Still, as long as you’re sensible about how and where you fish, SUP angling may be a great option. You can get into the game for a mere $500 or so, fish effectively where no normal boat can go, and if the fish aren’t biting… go surfing, instead?